Not all infants suffering from reflux actually vomit; some may have infant silent reflux - where the stomach contents only come part way up the esophagus. Sometimes you may hear the baby reflux, or see them swallow repeatedly, and see no evidence of it. Your baby may suddenly start crying while feeding, or afterwards, without any other obvious cause for the crying, or they may grimace, or make a screwed up face like they are tasting something bad - they may, in fact, be tasting the acidic reflux. Many babies with infant silent reflux, especially very sleepy ones, do not show any pain or discomfort for up to 3 months of age. Since the signs of silent reflux are not always obvious, it can be difficult for doctors to confirm the condition, and for a diagnosis to be made. Medical intervention may be necessary asthe same complications can arise as in other forms of infant reflux. Infant silent reflux can be more damaging because it can sit in the esophagus longer (the refluxate burns the esophagus on the way up and again on the way down). Reflux may be hereditary and is quite common in premature babies. It may worsen if the child becomes ill from cold or flu, has allergies, is teething, has immunizations, is overtired, out of routine, or if the weather changes dramatically. It may even worsen when the baby is crawling. The infant can also go through quite “normal” phases where the problem appears to be improving and then re-occurs quite suddenly for no apparent reason. 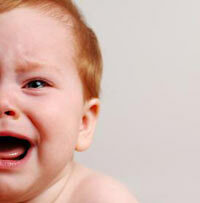 This occurs because infant silent reflux can be cyclic. The amount of pain does not necessarily correlate to the amount of inflammation or damage seen with testing infant silent reflux. Some children can have severe pain, and show no inflammation, while others can have no pain and show signs of severe inflammation.